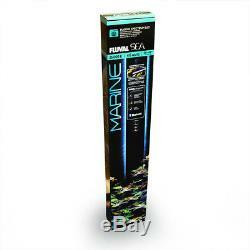 Sea & Marine (36" - 48") Spectrum Bluetooth LED (46 watt) - Fluval. 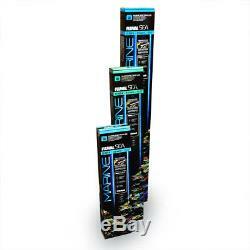 Marine Spectrum LED is designed for hobbyists who want to maintain a thriving saltwater aquarium. Featuring free FluvalSmart App technology, the light offers a variety of customizable options controlled via Bluetooth on your mobile device. Programmable, gradual 24-hour light cycle settings (sunrise, midday, sunset and night). 7 unique band waves for full spectrum results. Optional pre-set habitat light configurations (Sunny Reef, Deep Sea Glo, Color Burst). The new generation of H. E (High Thermal Efficiency) LEDs function at a higher operating temperature, providing improved long-term light output and spectral performance. Fully encased aluminum shell provides effective heat transfer and improved protection from water intrusion and humidity. 50% lighter, smoother frame than previous generation. Larger Touch-Switch surface and design offers stable control without any fuss. Deep coverage - each individual LED casts 120° of illumination for wider, uniform lighting without dead spots. Extendable range: 36-48 in (91-122 cm). Our primary warehouses are in PA and AZ. Tracking information is provided with every order. Customers must allow an extra week of processing time for some items. We learned early on that going that extra inch can help your business tremendously. At SaltwaterAquarium we strive to do things different. We aim to keep things simple and only sell products we currently own or have used in the past. We know the products inside and out because, we use them in our reefs/tanks. We should be able to answer any question you have. Setting up our store in this manner makes for a better overall experience for you the customer. Auctiva offers Free Image Hosting and Editing. The item "SEA & MARINE (36-48) SPECTRUM BLUETOOTH AQUARIUM LED LIGHT (46 WATT) FLUVAL" is in sale since Monday, March 5, 2018. This item is in the category "Pet Supplies\Fish & Aquariums\Lighting & Bulbs".